Busy moments and a How to. Busy times at the Pre-Tech office. There will also be a free (albeit late) Easter treat for all your little ones out there! We have also had some power jack replacements come in. 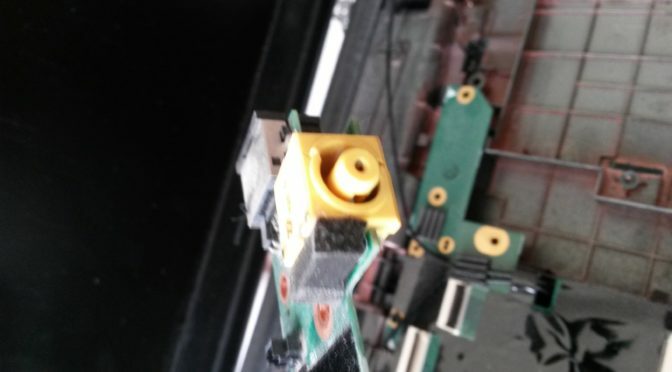 I have included the most recent one which was a Lenovo Thinkpad and how to get to that damaged port. First of all, remove the battery and all the back screws including the back panel. You also need to remove the optical drive and remove the screw you will find under that. Now to you need to remove the wires from the Wifi card and the Hard Drive to be able to remove the rest of the screws. Don’t forget the screws under the battery and the screws on the rear of the laptop. There should be two of those. Now you want to carefully remove the keyboard. Use a flat screw driver unclip from the bottom and the top should slide out. Under the keyboard will be ribbon cables that connect the keyboard and mouse to the mother board. Carefully remove these. These are the cables. Carefully unplug those and remove all the screws you see under the keyboard. After you have removed all the screws, you can remove the entire top section and palm rest of the keyboard. You’ll find it has been clipped in place, slowly remove the palm rest to avoid breaking any of the clips. The power jack has its own board in the top right. Remove the screws holding the board down and then unplug the small black cable you’ll see. (It will be a two pin plug) You may have to lift the monitor hinge out of the way and then carefully remove the board. It will be connected to the mother board via a plug be careful not to break this. And here is the offending plug! You can either desolder the plug and replace the jack or simply replace the whole board for a bit more cash. After you have your replacement, simply reverse the whole process and put it back together again!